Mandy Aftel has sent her newest fragrance through. WOO HOO! Imagine a deep, dark, peppery animalic. Awash with amber vanilla and lightly salted ambergris. I’m totally loving the way this smells, it has the multi facets of natural perfumery but so beautifully blended that you’ll not pick it. Scott and I are 100% into Alchemy. Brigitte sent me a care package with some teas and St Clair Scents. Considering how simple the note list is that we are given Frost is a delicate but intricate scent. Citruses, petigrain and coriander create something greater than the parts that produced it. Galbanum, tomato leaf, jasmine and apricot combine to create a water park smell. It’s deliciously white floral and has that odd plastic vibe that comes with some aldehydes. Very wearable and fun. Slightly foodie in a all natural cafe kinda way. Cross a cigar with hay, cut some grass and herbs, drizzle it all in honey and you’ll smell First Cut. This is the one APJ readers have been going crazy for. A modern reinterpretation of Fougere Bengale without the heavy curry. I can see why you love it. Scott and I also grabbed this one out of a box of decants. Roses, woods and the prettiest real deal taste of peach. A wash of fragrance so lovely and perfect for balmy spring days. No worry if you’re working, quite a private scent but you’ll still be fragrant. I would love it even more if it was the price of L’Occitane, because it would fit beautifully into that line too. Dior Belle du Jour seems different interpretation from Eris Belle du Jour, that one smells less mainstream. The Eris perfumes are exquisite. Far from the madding crowd. Such fun that you received samples of the St. Clair Scents. I profess a weakness for First Cut. It’s especially uplifting in any kind of crummy non-summer weather, which here, seems to be most of the time. I hope the lovely perfume fairy manages to get you a sample of the newest St. Clair Scent, Casablanca. It was just released a couple of days ago. Features tuberose, orange blossom and jasmine, amongst others. I’ve ordered a sample and look forward to receiving it. Woo Hoo! Very exciting to read they have a new scent. I may even have it in another pack that arrived recently Marcella. I’ll look. Thanks Marcella 🙂 I’ll enjoy them for sure. I enjoyed the St Clair Scents fragrances although none of them sparked a purchase and I passed on my samples. Must get my hands on the new one, though!! I will Matty, thank you! Only new perfumes for me…i mean a lot of them i’ve never heard before. Since i’m a Dior fanboy, i would love to try that Belle de Jour. I’ve heard a lot of bad things about the new releases from Dior Prive line. Well i think is really hard to come with some big hits after the classic flawless old prive line. I think they are not targeting perfumistas but the new kids who can’t cope with the big hitters and Asian market where softly, softly is in the best possible taste. I’m sure they’ll come good again. The Sandalwood one is nice that they released this t=year. Love that. Thanks for sharing. The reviews were great. I remember reading them. These, plus Mrs. Marzipan’s enthusiasm let me to purchase the sample set. First Cut will be my upcoming purchase. Will you let Mr Laurelhardy try it out? 😉 Ir would that be too dangerous? Hell yeah is right! Then she will be like a cat with catnip LOL! obviously, no need to enter me in this draw. thanks for the mini reviews!!! Neva, don’t worry, I haven’t tried them either😢. We can be sad together. I am trying the new one because – oakmoss. The others didn’t do a lot for me. I’ll be brief: I’ve tried none but the hype around Diane St. Clair’s scents is unbelievable. I’ve tried VC&A Van Cleef this week. It’s nice but so not me. I love that an Indie is getting the hype currently. Go in with no expectations though. OH NOOOOO VC&A Van Cleef wasn’t you? I’m surprised. Oh well, your wallet will thank you. Portia, I seem to be moving farther from a certain type of the 80-es & early 90-es scents, perhaps that’s why VC didn’t work for me. It’s a great big scent, though. Is that the l990s one Diana? I should love this but cannot wear it at all. Yes, Cassie, it was released in 1993. The notes should’ve worked for me, too. I’ll revisit it later: even if it’s not something I’d want to wear, I wish to know why (could be the calendula note, not sure). Yes, I have the same experience with this. It should work but doesn’t. First, on the other hand is fabulous. Love that one. Oh yeah! First was a stunner. Are you referring to a current version? I wore it, of course, in the late 70’s-80’s. I’d absolutely give it another go if it hasn’t been terribly mangled. I can’t believe I haven’t tried First yet! I will. I don’t know what the current one smells like, but if you can get some that is older than 10 years you’ll get a good idea. Blame Mrs. Marzipan for the St. Clair Scents hype. She started it all. I think she’s on their payroll. But seriously, I would like to see this one woman indie house get the accolades she deserves. And if I am going to spend from my extremely limited budget I am trying to be more moral and conscientious about it…as in NOT supporting the multi billion dollars industries that have literally bought out so many niche brands. And just to be clear I am NOT judging those of us who still purchase from the big guns. I am just conveying why I am so enthusiastic about the indies, which also includes 1000 Flowers, the maker of my beloved Reglisse Noire and where I am at in my perfume journey which is now in it’s 49th year. It’s a great point. 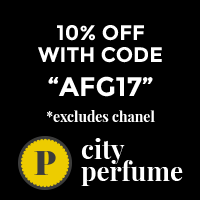 Small indie brands sometimes offer a unique view on perfumery, they deserve to be supported. “Let a hundred flowers blossom”. I get that. It just doesn’t feel right, does it. These wealthy corporations gobbling up perfume companies. Seems counter-productive in an industry where originality and a unique vision should be considered pre-requisites to a successful creation. You have an excellent point. Perhaps, with time, it will be the niche houses that become the standard bearer for beautiful, original, quality perfumes. Some of them do seem to be headed that way. YAY, thanks from the lucky winner! Interesting bunch of new sniffs Portia. None of which I have tried, although just recently I got a of Fougere Bengale. I did try Diptyque Tempo and something of CdGarcons at Mecca last week but neither made an impression. Hi Melanie, so you didn’t like Tempo? I got me another sample at Diptyque a few days ago and this weekend I’ll test it properly again. I liked it very much after the first wearing and consider buying a bottle. It has kind of a retro vibe which I appreciate in perfume. How did you like Fougere Bengale? I haven’t tried any of these. While I do like perfumes which last, I also like the smooth compositions in the Dior-line, so would like to try Belle du Jour at some point. Yeah, good call Ingeborg. They are beautifully blended, I forget that when I’m reminiscing about some of the original DCd ones.